Earlier this week Republican leaders in the Senate used a procedural tactic known as the nuclear option to change the process for confirming judicial nominees. This is the third time the procedural tactic has been used since 2013. Republicans cheered the change while Democrats have been critical of the tactic. But aside from the partisan mudslinging, what are the facts about this change? What will the new rules mean, and what is the data behind how we got here? What exactly happened with the nuclear option and how are Senate leaders reacting? How will this affect President Trump’s ability to fill vacancies in the federal judiciary? Ballotpedia has answers to these questions and more below. On Wednesday, the Senate voted 51-48 to reduce post-cloture debate on federal district court nominees from 30 hours to two hours (circuit court judges and Supreme Court justices still have 30 hour limits). The Senate made the same change for executive branch nominees below the Cabinet level. The two hour period begins after the Senate votes to invoke cloture—the process in which senators agree to end debate and bring a nomination or legislative act to a final vote. Cloture is often invoked to end procedural delay commonly known as a filibuster. It takes 51 votes to invoke cloture on a presidential nominee and 60 votes to invoke cloture on legislation. What is the difference between a federal district court and a circuit court? Federal district courts are the first level of the federal court system. Most federal criminal and civil cases originate in district courts. 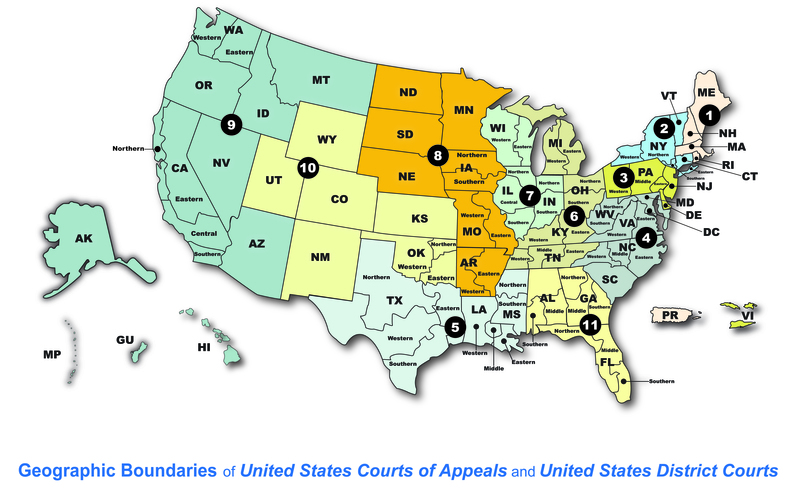 There are 94 district courts nationwide, with each state having between one and four associated district courts. There are 677 federal judge positions in the district court system. Circuit courts are the intermediate appellate level of the federal court system, falling in between district courts and the Supreme Court. There are 13 circuit courts, including 11 numbered circuits which each handle appeals originating in a particular group of states. A 12th court handles appeals originating in the District of Columbia. The Court of Appeals for the Federal Circuit handles appeals which deal with specific subject areas. There are 179 federal judge positions in the circuit court system. What does the nuclear option actually mean? To enact this change, Senate Republicans used a parliamentary tactic known as the nuclear option: a procedure that allows the majority party to change a Senate precedent with a simple majority vote. Without the nuclear option, changing the Senate’s standing rules requires a two-thirds vote. On Tuesday, Republicans tried to pass the change in the form of a standing resolution, but they did not receive the required 60 votes. The term nuclear option was first coined in 2003 by Sen. Trent Lott (R-Miss.). To deploy the nuclear option, Senate Majority Leader Mitch McConnell (R-Ky.) raised a point of order during the consideration of Roy Altman to serve on the U.S. District Court for the Southern District of Florida. His point of order stated that debate should be limited to two hours after cloture is invoked on a judicial nominee. After the presiding officer of the Senate ruled against McConnell’s point of order, 51 Senate Republicans–all except Susan Collins (R-Me.) and Mike Lee (R-Ut. )–voted to overrule the chair’s decision. 2013: Senate Majority Leader Harry Reid (D-Nev.) changed the threshold for invoking cloture for all presidential nominees except Supreme Court justices from 60 votes to 51 votes. 2017: McConnell reduced the cloture threshold for Supreme Court nominees from 60 votes to 51 votes when the Senate was considering Neil Gorsuch’s nomination. Who was the first judge to be confirmed under the new precedent? Altman was the first judge to be confirmed under the new precedent. Altman is the first Trump judicial nominee to the U.S. District Court for the Southern District of Florida and brings its composition to seven Republican-appointed judges and seven Democratic-appointed judges. There are four other vacancies on the bench. Two Trump nominees who, like Altman, were nominated on May 7, 2018—Rodolfo Ruiz and Rodney Smith—are awaiting confirmation. How many judges are awaiting confirmation? Seventy-five of President Trump’s judicial nominees have yet to be confirmed. This figure includes 49 nominees who have been approved by the Judiciary Committee and are awaiting only a vote before the full Senate as well as 26 nominees who have yet to appear before the committee. 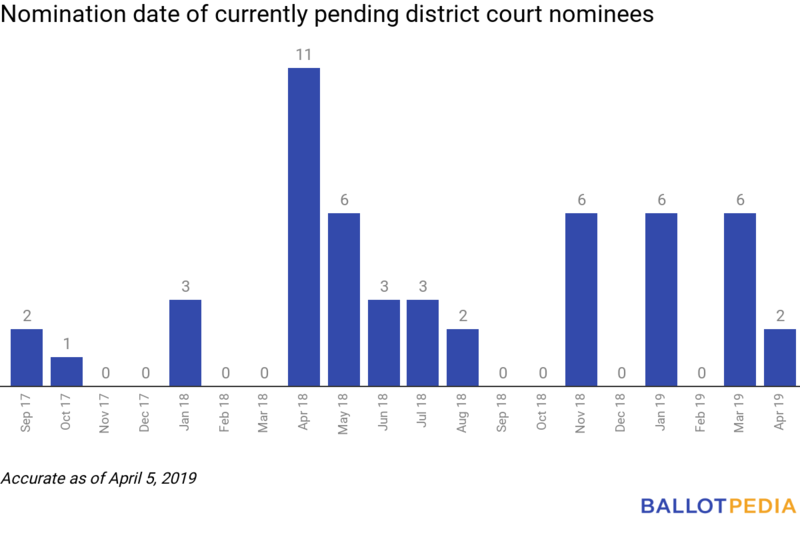 Of the 75 judicial nominees awaiting confirmation, 56 are nominees to district courts. Thirty-nine of those district court nominees are only awaiting a vote before the full Senate. Thirty-one of the 39 district court nominees were nominated more than six months ago. Seventeen were nominated in April 2018 or earlier. Over the course of the Trump administration, the highest number of concurrent judicial vacancies occurred in August 2018, when there were 158 vacant judicial seats. The lowest number of concurrent vacancies was in February 2017, when 117 federal judgeships were vacant. How many district court judges have been nominated to the federal judiciary? Judge Altman is the 54th Trump nominee to have been confirmed to a District Court by the U.S. Senate. The District Courts with the most Trump appointees are the U.S. District Courts for the Western Districts of Pennsylvania and of Texas, which each have three Trump appointees. Between 1933 and 2017, the average rate of successful District Court nominations was 27.4 per year. This has increased in recent years, with Bill Clinton (D) averaging 38.1 per year, George W. Bush (R) averaging 32.6 per year, and Barack Obama (D) averaging 33.5 per year. President Trump’s 54 appointments put him at an approximate rate of 24 per year. What are the longest/oldest vacancies right now? Judge Malcolm Howard’s seat on the U.S. District Court for the Eastern District of North Carolina has been vacant the longest. Howard retired from full-time service, assuming senior status, on December 31, 2005—a 13-year vacancy. There is no pending nominee for this seat. The second-longest vacancy is on the U.S. District Court for the Southern District of Texas. Judge Janis Jack vacated the seat on June 1, 2011, when she assumed senior status. President Trump nominated David Morales to fill this seat on April 12, 2018. Morales is currently awaiting a vote in the U.S. Senate. Which of President Trump’s nominations have been waiting the longest? Of the 49 Trump nominees who have passed through the Senate Judiciary Committee and are awaiting a vote before the full Senate, four were nominated in 2017, 27 were nominated in the first six months of 2018, 12 were nominated in the latter six months of 2018, and six were nominated in 2019. The four nominees who began the process in 2017 are Matthew Kacsmaryk (U.S. District Court for the Northern District of Texas), Ryan Holte (U.S. Court of Federal Claims), Howard Nielson (U.S. District Court for the District of Utah), and Daniel Domenico (U.S. District Court of the District of Colorado). With the nuclear option in place, how fast will nominees be confirmed? Before the precedent changed, Adam Jentleson, a former Harry Reid staffer, wrote in a Washington Post op-ed that Senate Democrats could drag out judicial confirmations to four days using the cloture process. George Washington University political scientist Sarah Binder found that the median time spent in post-cloture debate was 22 hours for judicial nominations from 2017 to 2018. University of Georgia political scientist Tony Madonna expects the four-day confirmation period mentioned by Jentleson to decrease under the new precedent (although this could be affected by whether there is an even split in debate time between Democrats and Republicans). Madonna said it is unclear how much this change will affect the federal judiciary’s vacancy rate because some of the delay comes during the executive branch’s vetting process and before the nominations reach the Senate. Senate Republicans used the nuclear option to shorten the amount of time that can be spent debating judicial nominees after cloture has been invoked from 30 hours to two hours. The change covers district court nominees and does not apply to circuit court or Supreme Court nominees. Federal district courts are the first level of the federal court system, while the circuit courts and the Supreme Court generally handle appeals from district courts. This was the third time the Senate has changed Senate precedent using the nuclear option since 2013. In the other two instances, the Senate worked to reduce the cloture threshold for all presidential nominees, including Supreme Court nominees, from 60 votes to 51 votes. Judge Roy Altman was the first judge confirmed under the new post-cloture debate rules. He will serve as a District Court judge in Florida. The Senate has confirmed 54 of Trump’s district court nominees so far. Fifty-six more await confirmation, including 39 who only need a vote in the full Senate. Thirty-one of the 39 were nominated more than six months ago. Political scientist Tony Madonna told Ballotpedia that the maximum period between invoking cloture on a judicial nominee and confirming that nominee will likely be reduced under the new precedent. He said the likely effects of the debate changes on the federal judiciary vacancy rate are unclear because much of the delay comes during the executive branch’s vetting process. This analysis was authored by David Luchs, Rob Oldham, and Sara Reynolds.